1. There is only 1 confetti launcher, so your only choice is which confetti option you would like included. Click "rent" on your selection and proceed to follow the instructions to make an online reservation. 2. Fill out the Rental Agreement and pay the deposit. The reservation deposit for the confetti launcher is $40. 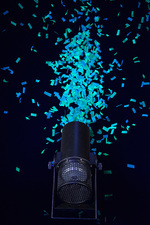 This is a non-refundable deposit required to hold a confetti cannon for you on the date you request. 3. 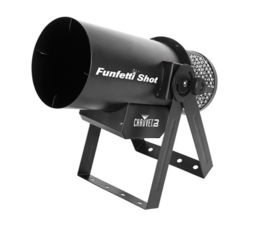 The confetti and cannon are guaranteed to arrive at least 2 days prior to your event date. The shipping is always free. 4. 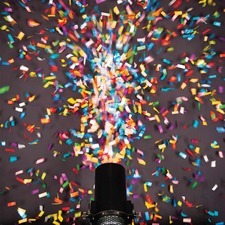 Set up at your event and blast confetti all over your party crowd! 5. Make sure you save all the boxes and packaging. After your party, pack everything back up into the original boxes. There will be a pre-paid UPS return label in the box. Put the return label on the box, tape it up, and drop it off at a UPS store. Make sure you drop everything off before the due date so you don't get charged any late fees.